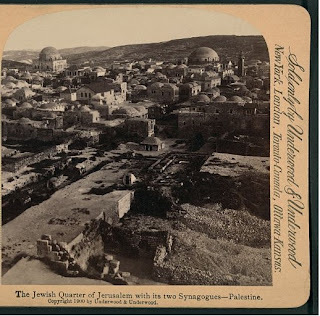 When the Jews returned to the Old City of Jerusalem after the June 1967 war, they were shocked to find the synagogues they left behind destroyed and in rubble. Some of the synagogues were hundreds of years old and were prominent features of Jerusalem's landscape, as shown in these pages in a previous photo essay on synagogue exteriors. 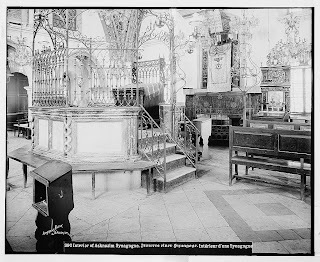 Built in 1870 by Hungarian Jews, the synagogue was known as the Ungarin Shul, built inside the Shomrei HaChomos Kollel (Talmudic study center). In 1904, a second story was added to the synagogue giving it a very prominent view of the Temple Mount 100 meters away. The Arab riots in 1920 and 1929 threatened the Jewish community in the Old City, and their ties to the synagogue and yeshiva in the building were severely disrupted. The riots and pogroms of the Arab Revolt in Palestine (1936-1939) forced the Jewish congregants to abandon the synagogue in 1938. The Jordanian Legion captured the Old City in 1948, and the building was destroyed. 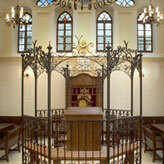 In 2008 the Ohel Yitzhak Synagogue was rebuilt and beautifully restored, under the sponsorship of the Moskowitz family of the United States. Today, the synagogue is administered by the Western Wall Heritage Foundation. Next in this series: The "Churva" Synagogue. Thanks for all your work . Really enjoying these photos. Agreed. I look forward to them every morning. Thank you!